The spacious stone house is located on the outskirts of Agios Nikolaos, yet it is only minutes away from the port with its shops, cafes and tavernas. With it's three bedrooms it is meant for six people, but also offers space for two extra persons. 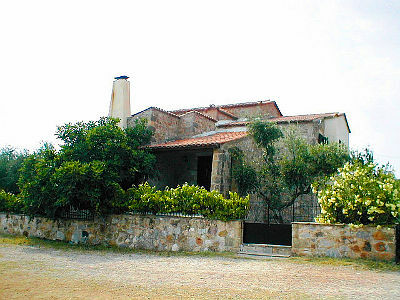 The master bedroom is on the top floor, with a large balcony overlooking the sea which is about 100 meters away. In a mezzanine level, guests will find the bathroom with a bath and another bedroom with two single beds. From here one has the view on the massive mountain range in the inner land. In the ground floor is the kitchen, dining/ living room with a fireplace located. From living/dining room one can get to an open and covered porch and from there into the garden with its well established olive, citrus and fig trees. There is also a barbeque area. From the kitchen, equipped with electric stove, refrigerator and freezer, coffee machine, kettle and toaster, just a few steps lead down into another bedroom whith two beds. It has a small ensuite bathroom with shower and toilet and a private garden access. The two upper bedrooms have air conditioners, in other areas there are fans. Facilities include a television and a DVD player in the living room, electric hairdryer and a baby bed.